Today, we have a carriage dress for Florence. Carriage dresses differed from walking dresses for the Victorian lady because they were intended to be worn while riding in a carriage. So, they often feature long trains and longer skirts. It’s odd to realize that the bustle was originally considered a more rational solution to the huge width that crinoline skirts had grown too. Fashion can be such a funny thing. Outside, the snow has coated the ground and it is a beautiful white covering. It makes everything look so peaceful. Unfortunately, it also makes everything so very cold. I avoid spending much time outside in this icy Illinois winter. 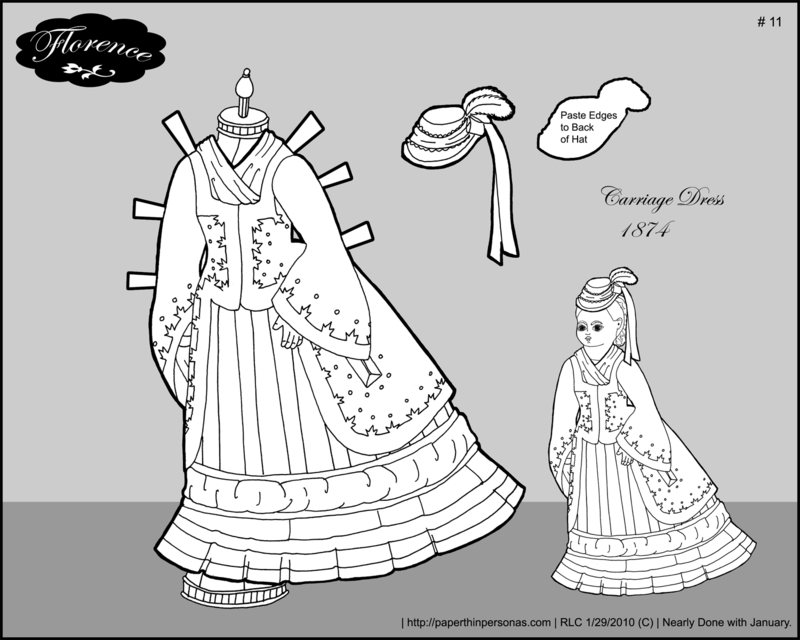 Here is Florence, the paper doll that wears this series of gowns.